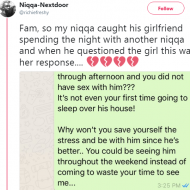 If your partner catches you Cheat!ng on them, there are certain things that you can do to help minimize the pain and the damage to your relationship, especially if you’re truly sorry. By this, we mean throw away or destroy sexts, voicemails, receipts, or anything else related to the affair because your partner doesn’t need to know all the details of what went on. It will only make them feel worse. Keeping reminders of your affair isn’t healthy for anyone. If you want to have a happy, healthy relationship, it’ll require a cleanse, so to speak. Love yourself enough to get rid of everything related to the affair. It’s impossible for life to return to the way it was prior to Cheat!ng, as there are now major trust issues which will take time to heal. Something needs to change for you and your partner to move forward; how things were obviously wasn’t working, otherwise, you wouldn’t have been caught Cheat!ng. Get used to the ‘new normal’ and settle in for the long haul. Denying that you strayed from your relationship will only make your partner more angry and frustrated, so tell the truth if you’ve been caught Cheat!ng. If they already know what happened, there is no point in lying about it. All the lies and covering up make the situation much more difficult to move on from. So, why not just come clean? Understand that your partner is in shock, and give them some space and time while making yourself available to answer any questions they might have. If you try to ignore or lie about your unfaithfulness and infidelity, you’ll only cause your partner more hurt, resentment, and damage. It’s up to you whether you want to repair the relationship or not, so no letting your friends or family in on the decision making is the best thing. Only you know what’s best for yourself and what will work going forward after you’ve been caught Cheat!ng. It’s extremely important for the partner who betrayed to look inside himself to have a deeper sense of why the affair began in the first place. You should make the final decision on whether you want to continue with the relationship or not. Try and see a therapist. It’s totally normal to seek professional help from an objective, non-judgmental, third party if you’ve been caught Cheat!ng. The counselling isn’t to resolve the overall issues you have, but rather to help you “deal with the crisis while it’s hot, providing an opportunity to discuss and exchange information without emotionally getting out of hand. Counseling can help you communicate better and it will give you peace of mind knowing that you tried to make things work if you do decide to step away from your partner and relationship.